I never remember being a huge fan of root beer when I was a kid. I’d drink it, but the unusual, deep-root flavors were a bit much for my young, Standard American Diet, unevolved palate. It was sweet, though, so I’d drink it. When I got older, I learned that root beer — with sassafras root as the primary ingredient — was a uniquely American beverage, and that people have been using this herb to make beverages on this continent for a very long time. 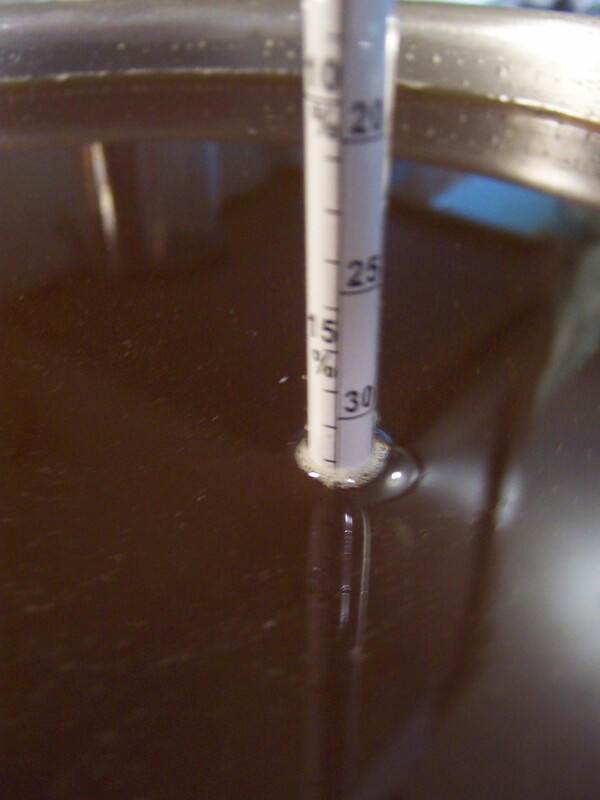 Naturally, I wanted to make a mead based on this centuries-old technique of root beer. There are a few ingredients I wanted to use. 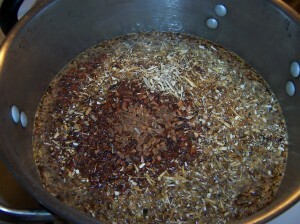 The obvious one is sassafras root, because it’s been the main traditional ingredient in root beer for a very long time. In addition, sarsaparilla has been used quite a bit in root beers, so it felt natural to include it here as well. Lastly, spikenard root is another herb local to my northern New England ecosystem that has a similar flavor. We begin with details on these three ingredients. Sassafras (Sassafras albidum) is one of the primary medicinal herbs of the American continent, having been used for hundreds (if not thousands) of years by the indigenous people, as well as European colonists, both medicinally and for tonic, tasty beverages. In nineteenth-century herbal medicine, it was regarded as “a tonic, blood purifying herb, an aromatic stimulant, warming, diaphoretic, diuretic, and alterative,” which means that “it helps liver function, helps cleanse the bloodstream of accumulated tocins from a monotonous winter diet, and provides a warming stimulation to all parts of the body” (Buhner 302-303). In recent years, there has been some controversy over whether or not sassafras is carcinogenic, since it was categorized by the FDA as such in the late 20th century. Indeed, there is some carcinogenic activity in safrole, which is the main volatile oil in sassafras. This categorization is in conflict with the fact that sassafras has been used extensively by indigenous people for generations; furthermore, these populations had very little incidence of cancer in general. Buhner notes that “the FDA ban [on sassafras] is thus, like many FDA bans, absurd,” because the safrole in a 12-ounce can of old-fashioned root beer is not as carcinogenic as the ethanol in a can of beer. I leave to the reader to decide, but I have no problem emulating our ancestors in my beverage preparation. Sarsaparilla (Smilax regelii), also known as China root, was another medicinal root used extensively by North American healers for generations. In the early 19th century it became an in-demand ingredient in Europe and the UK, and there was a lively export trade around this species indigenous to North America. It has a lovely scent and flavor, and is a tonic for the whole body. According to Buhner, “it has been found to possess antibiotic and antimicrobial activity and is useful in digestive complaints, for fevers, as a diuretic, and for hypertension” (Buhner 284). I first heard about Spikenard Root (Aralia racemosa) from my friend and botany expert Arthur Haines. When I mentioned to him that I was doing a root mead, he said right away that I should include spikenard, since it is similar in flavor and effect to the above two more common herbs, and is indigenous to northern New England. “Known since ancient times, spikenard is named in the Old Testament as one of the ingredients in the incense burned in the holy temple of Jerusalem. The powdered root is cited in some Islamic traditions as the forbidden fruit Adam ate in the garden of Eden against God’s wishes. In medieval Europe spikenard was part of the spice blend used in Hypocras, a sweetened wine drink” (from Mountain Rose Herbs). I let this simmer for another 2 hours, before turning the heat off and cooling down the decoction, by dunking the stockpot into a sinkful of cold tap water. I let the tap water around the stockpot warm up, drawing the heat out of the decoction, then drained the sink, then repeated the process twice to complete the cooling. I’m actually quite pleased with how will this works, it reduces the tea to room temperature within an hour or so at most. Sorry for the slight blur. This is just about 19% initial alcohol potential. I then added the must, along with the rehydrated Red Star Montrachet yeast into a 3 gallon carboy, shook it well to mix/oxidize the must, and capped it off with an airlock. 24 hours later (as I write this) it is happily bubbling away. This should be another very interesting experiment, and as always I look forward to sampling the results! This mead cleared very quickly! By the time I racked it 5 weeks in it was pretty close to clear enough to bottle. Very cool! It comes in at around 4% remaining alcohol so it is quite sweet, and stands at about 15% alcohol. It’s delicious! Already very much a success, and it will only get better as it mellows a bit with age. I’m thinking about tossing a vanilla bean in to each jug to further smooth the flavor. Previous Previous post: Mad Trad – Not Half Bad! Next Next post: New Meadmaking Class in Maine? And Ohio?